Prestige Courtyards in Sholinganallur, Chennai South by Prestige Group is a residential project. The size of the Apartment ranges in between 599.0 sq.ft. 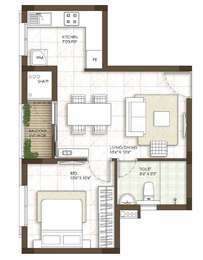 and 1869.0 sq.ft. Prestige Courtyards price ranges from 28.99 Lacs to 1.26 Cr. Prestige Courtyards offers facilities such as Gymnasium and Lift. This is a RERA registered project with registration number TN/01/BUILDING/0069/2018. The project is spread over a total area of 11.34 acres of land. It has 66% of open space. Prestige Courtyards has a total of 11 towers. The construction is of 3 floors. An accommodation of 548 units has been provided. In which area is Prestige Courtyards located?The project is situated in Sholinganallur, Chennai South. What apartment sizes are available in Prestige Courtyards? The project offers apartments sized between 599.0 sqft and 1869.0 sqft. 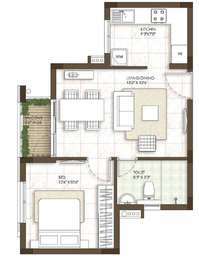 What is the area of 2 bhk in Prestige Courtyards? 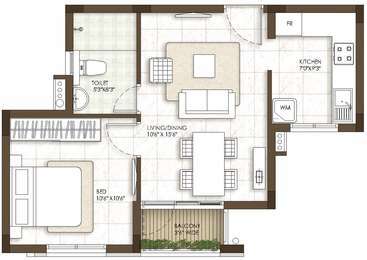 The size of a 2BHK unit in the project ranges from 1237.0 sqft to 1468.0 sqft. What is the area of Prestige Courtyards?The total area that the project occupies is 11.34 Acres. Sufficient power outlets and light points provided for. Hi Afsar, How may i help you?